Relatively speaking, DoubleTake has merged the past with the future into a present for you with their Pairody™ parody. 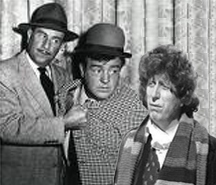 Don't know Abbot, Costello, or Doctor Who? What's wrong with you? Wake up and smell the comedy. 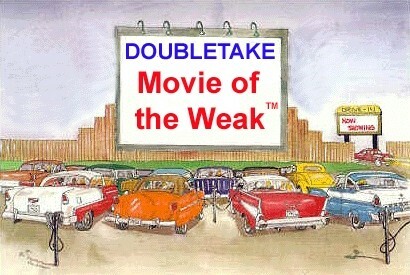 DoubleTake uses the movies to make a few political points ... or is that uses a few points to make a few movies? A lot of political bedfellows (a truly sexist term) "make" the bed, each other, and some movies "extra" fun. Picture if you will, The Saturday Night Live TwiNlight Zone. 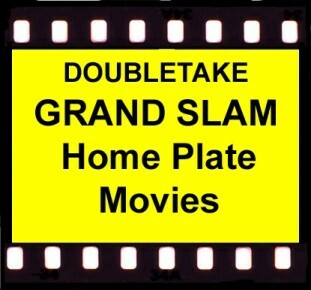 DoubleTake takes aim at the movies, with some title and plot "checkered" twists. ...even if it ain't Christmas (unless our web guy forgot to change this line). 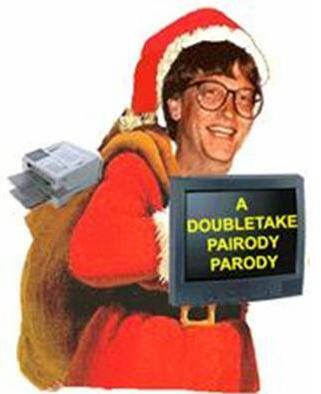 If you love or hate technology – it's a techno-take on the famous XMAS poem. And since we're talking about doubletaking a holiday: What do DoubleTake, Jimmy Buffet, Sir Isaac Newton, Sissy Spacek, Humphrey Bogart, Cab Calloway, Clara Barton, Little Richard, and Rod Sterling all have in common? Answer: We were all born on Christmas.